The weather has been pretty good, dry, only a day or so of rain, this week. The weekly knitting report: socks are finished. I started some plain gloves but once again, I need to consult another book or two to get it all straightened out in my head. I am more used to following sewing patterns with drawings of each step. I did buy Patons Book 7 on Mittens and gloves.I had a ball of cotton linen combo and am making a couple of washcloths. Nothing worthy of a photo. Sewing: Sorting out the pile of abandoned projects: First up a blouse, No pattern any more so made my own adjustments. There was a long tie that was supposed to go around the waist, I think on the inside. I gave up on that and converted the tie into a bow at the waist. Added some snaps and hooks and eyes to keep it closed and finally a little gathering in the back to snug in the back abit. I am sort of wondering if this is a complete waste of time and will I like it any better this time. I discovered a few more tweaks are still needed. 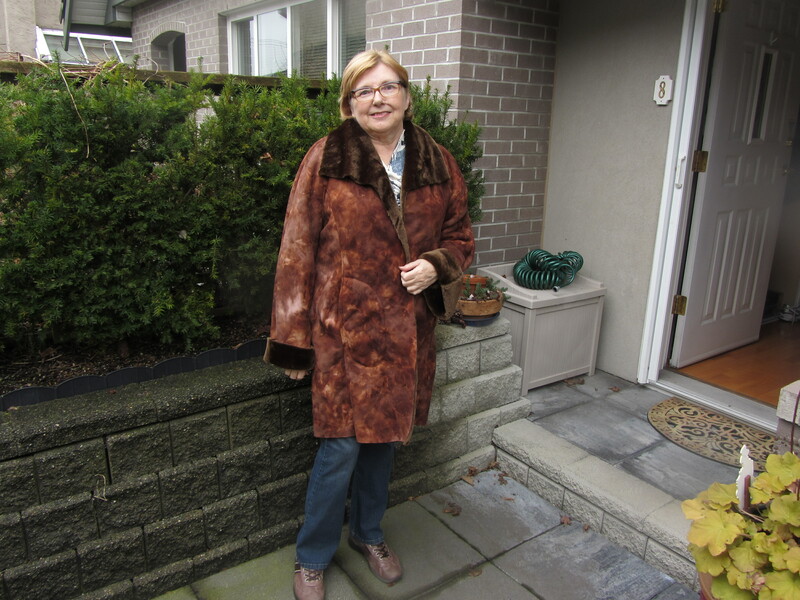 The second abandoned project was a winter faux fur coat. Vogue 7627 size medium, now out of print. I got some toggle closures the other day and finally figured out a few things that had me stymied. I remember last time I was so frustrated with the amount of vacumming it caused with fur flying everywhere. It will need a cold blustery day to be worn but will take up less room in the closet than 2 bags in the sewing room. Toggles and a better seam finish at the collar are still needed. It is a pretty heavy coat to wear. Dare to be Inspired Days had the first outing of the year. We went to Plac des Arts to the tapestry show, which was great, we also enjoyed the two other exhibits. We then went to Fabricana and followed it up with lunch. I wore my new cardigan, Miss BB and it was reallly comfortable. I did get to exercises a few times but made the mistake of putting on my runners, I thought that they would be better than the walking shoes I normally wear. Big mistake not enough padding in the toes. So I aggrevated my arthritis, strained the hips and back. Discovered I need to make adjustments to my hand position. So every thing now is feeling better, Must listen to the body! Little things, a change of scale. It was Dare to Be Inspired Day again this past week. It was not as well organized, I was having trouble getting inspired. People had appointments, were baby sitting and there was extra maintence men working on the townhouse at the same time. It was decided on Saturday to do inchies. I watched a ton of you tube videos, visited blogs and decided that I should make a few on Monday night. I know very last minute. I had tried fabric a couple of weeks before but I need to find an easier way than my lackadaisicel method, so the switch to paper was a good thing. I had also decided to include some embossed paper beads. The group had made them before making a much larger bead and I thought we should change up the scale and go really small. I have to confess, that is just the way I am, the inches are not 1×1 inch square but 1 3/8 inches by 1 3/8 inches because that is the size of my paper punch. I have included a couple of beads made last year for a size comparison. 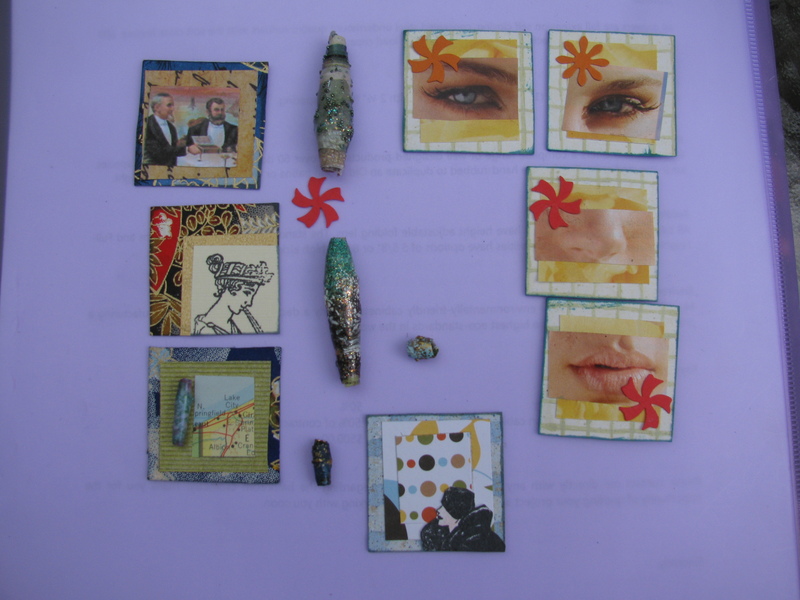 At the current time, I am in Love, Love, Love (as my teacher Suzi would say) with working with mixed media. 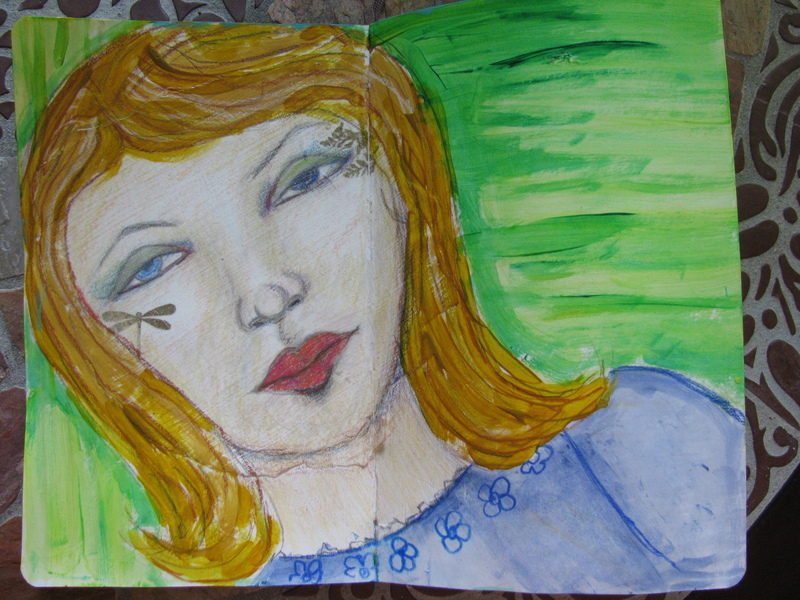 I am taking the Goddess and the Poet with Suzi Blu, I want to work in my moleskine journal every couple of hours. I have nothing finished yet but have more than 4 layers of paint, pencil and gesso plus embellishments on most of them now. I have six faces in the works. I took the course so that I could do better doll faces, I was getting tired of the same old look. So far I have used graphite, coloured pencils, clear gesso, fluid acrylics, rub on transfers. A few more layers are still needed. Project yarnway, I found some wonderful lace weight silk and merino yarn and am in the beginning stages of a camisole. It was hand dyed on the island. Lovely stuff. I bought it in Courtney at Uptown, the knitting store. Dare to be Inspired Day was this week, I am doing a canvas mixed media again but this one is based on Paris, and I intend to do ones on Athens, Barcelona and Rome as well. I need to go through photos, look up where we stayed in each city and get the dates. In the meantime, my mind is thinking about packing up the boat for vacation, buying fabric for chairs and drapes, finishing a new t shirt, getting the last of the plants in, when it is not raining. Just the usual things of life. 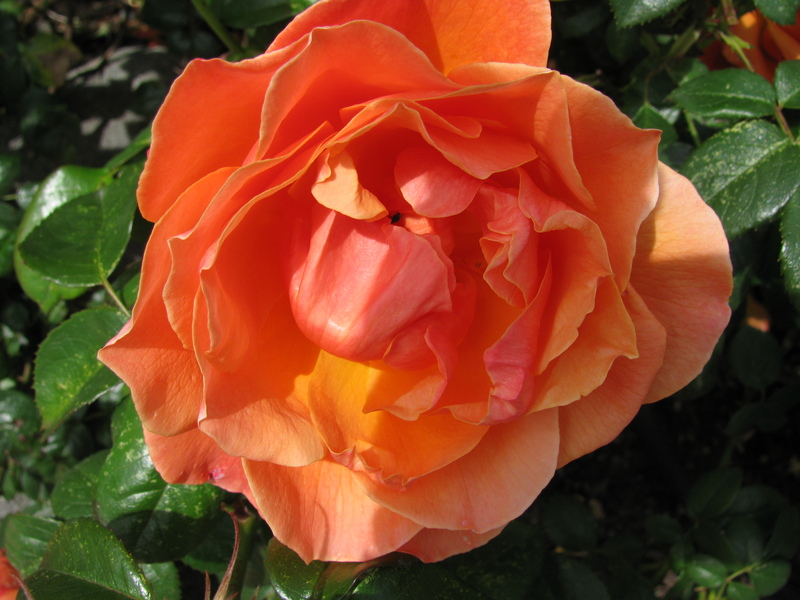 Meanwhile, I smell the roses, curtesey of my friends garden. We have tried a few things over the last year and a half, so it was a bit of a challenge to figure out what to do this time around. We shorted up the time a bit and decided to do a show and tell, my fabric piece from a couple of weeks ago, someone brought their finished jewelry projects for inspiration, another person had been to a workshop on transferring photos to fabric and showed us what that session was about and the last person showed her collage canvases. Next time up we will do the collages, but for now, we wanted to get the finishing details on our jewelry and charm bracelets a little more professional. My vacation buddy led us through jump rings, crimps and eye loops. It sounds easy but we all learned a few tricks that we hadn’t picked up from looking at videos and reading instructions. I think most of us will be out picking up a few new and better tools. 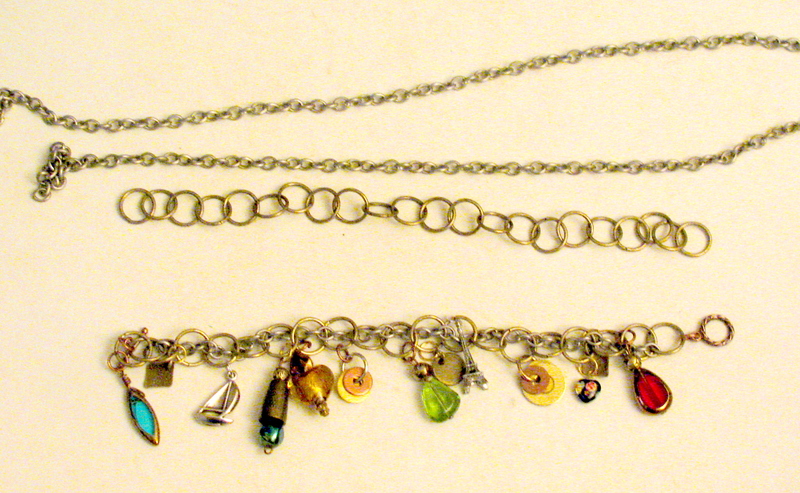 We decided that we wanted to do our own thing and not have any pressure about making charms for someone else. I am so looking forward to the next meeting to see what everyone thinks up. I wore my bracelet today and a couple of charms fell off, I was still in the house so I found the bits. Obviously a little more practice and care is needed. I bought some chains at Michael’s and wove them together. I wanted to use a variety of metals, so picked up some washers from the hardware store, used part of an old fastener from a coat tie, a few new glass charms and some old silver ones from my stash. Lots of room for more charms to add later. Over the past few years. I have taken up a few challenges. The Yarn Harlot hosted the knitting Olympics during the last winter Olympics, project spectrum years 3 and 4, some self imposed, like 12 pairs of knitted socks last year. Some years, I swapped ATC’s based on various themes. So besides being more aware of what I’m eating and increasing my exercise, I’d like a couple of mental challenges as well. Dare to be Inspired Days are coming up again and I have the idea that we will make some charms for bracelets. I have been out lately supplementing my jewelry making supplies and tools. I intend to do all of the GPP crusades this year and have started on the next one. As a fan of Project Runway, I have followed the tv shows for a few years, there is a spinoff in the Ravelry group. (You have to be a member.) 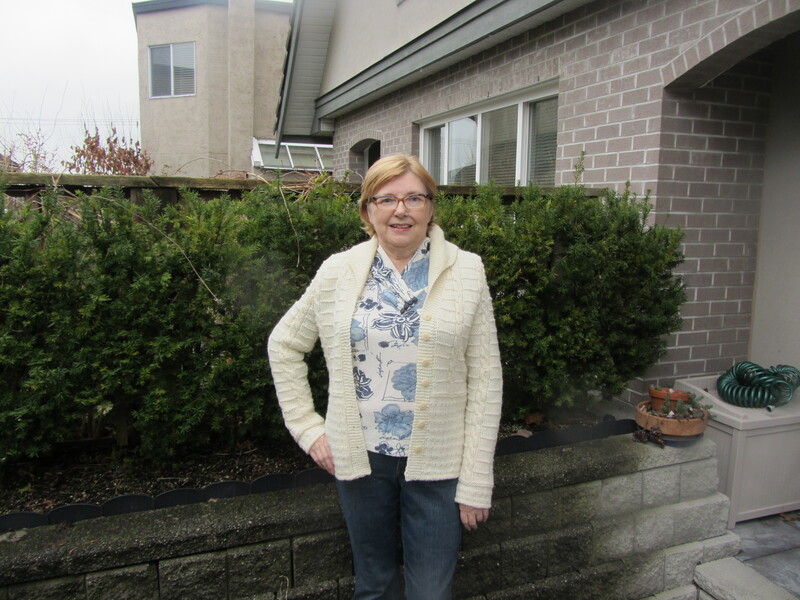 It is project yarnway and I have joined but not fully committed to a project yet. It will have 12 knitting challenges over the next 12 months. I have been interested in designing and just jumping in is the best way to learn. I have been playing with some needlework, one is a Christmas gift, not quite finished yet but I haven’t done any for a few years and I had forgotten how much I had enjoyed working out patterns and playing with my threads and beads. 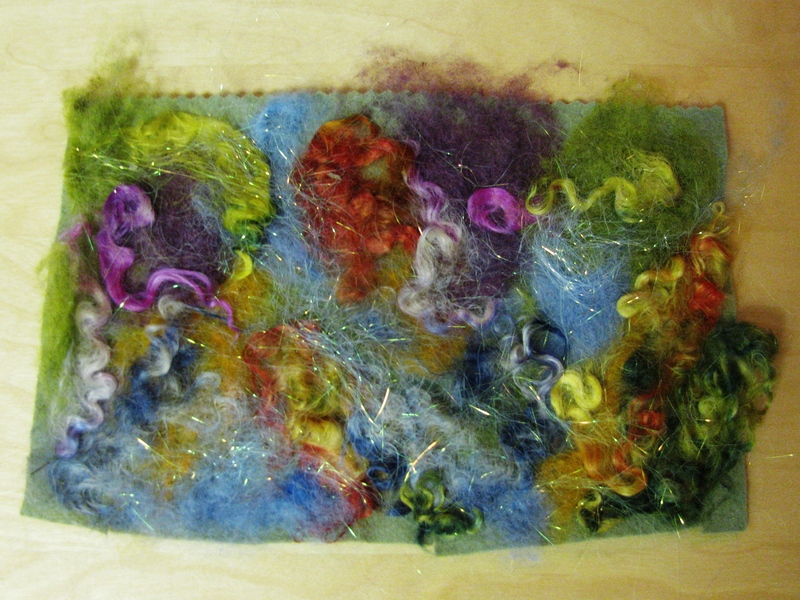 The other piece started, as a sample for Dare to be Inspired Day last month, with roving and angelina fibers needle felted onto a piece of felt. I then covered it with some crystal organza. 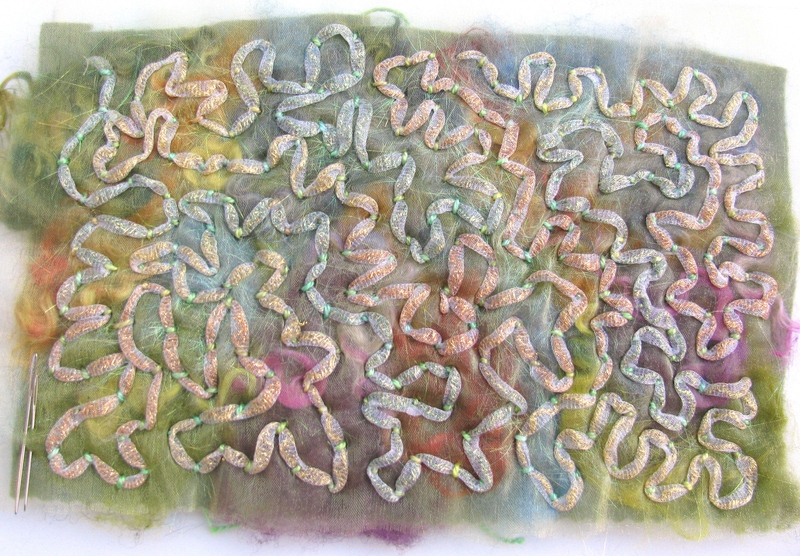 I was then going to machine embroider some multi-coloured thread over the top but got distracted by some tubular nylon with a varigated thread running it. 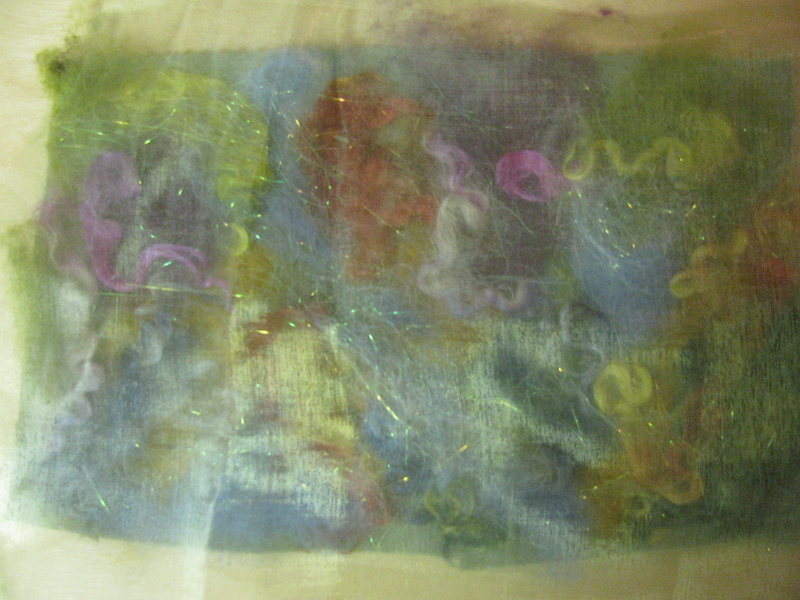 So I couched it all down in a wiggly pattern, with some DMC 5 , which I had dyed many years ago. I had the idea of making a folded wallet for my pocket when I didn’t want a purse. It would make an great bookcover, if the thread wasn’t likely to get caught in everything. So I guess it will sit until the next brainwave hits. Maybe a small evening bag but that is not really something I need. The last has had the colour balanced but is still not quite correct but closer than the first two photos. I found another 5 sheep and have put them out as well, some end up in the wrong boxes when I pack up my Christmas things. Another get together on last Tuesday, for the Dare to be Inspired group. There were 5 of us participating. We were playing with dyes, fabric paints and some acrylics. A few days before the meeting, I had applied some gesso to a large piece of canvas and wiped up the remains with some nappy liners that I hadn’t used before. I had all the supplies ready for my friends, and each was given several nappy liners, old dryer sheets, a piece of a dryel sheet, and some cheese cloth. For about an hour we applied paint to the fabrics and let them dry outside. I was really pleased with the results but don’t know what I will do with the pieces yet. I can see using all the pieces but the dryer sheets I think I will use in doll making and the nappy liners for book covers and a wall hanging that I have planned.